ONLINE REGISTRATION HAS ENDED. TICKETS ARE AVAILABLE AT THE DOOR. Bidding for teams will take place in a live auction event. Unlike traditional office pools where there are only a handful of winners, each winning team, per round, earns a portion of the pot for the owner of that team. You don’t need to pick the champion to win prizes! Betting syndicates encouraged! Get together with friends and form a “team” to pool your money together to have more bidding power. Sideboards and separate pools will be available at the event. 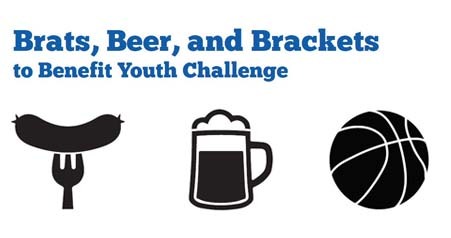 Proceeds benefit Youth Challenge and are split 50/50 between YC and the Bid pool. Complimentary childcare will be available by YC teen volunteers, limited spots! Contact acompton@youthchallengesports.com.